Except for a few afternoon clouds, mainly sunny. High around 65F. Winds WNW at 5 to 10 mph.. Partly cloudy skies during the evening will give way to cloudy skies overnight. Slight chance of a rain shower. Low near 45F. Winds SE at 5 to 10 mph. COURTESY PHOTO. Derry Lions Club member Pete Marcotte, right, receives an award honoring his 35 years of membership to the local club. At right and presenting the honor is New Hampshire 44-H District Governor Jerry Vaccaro. COURTESY PHOTO. 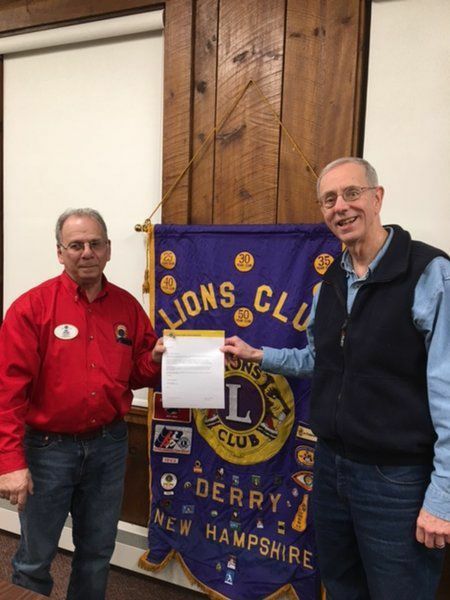 Gerry Daigle, right, a member of the Derry Lions Club was recently honored for his 35 years of membership in the Derry Club. At left is Lions' New Hampshire 44-H District Governor Jerry Vaccaro. 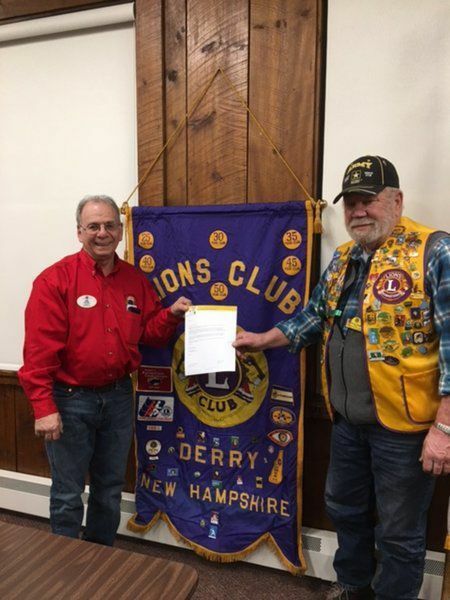 DERRY — The Derry Lions Club welcomed New Hampshire Lions 44-H District Governor Jerry Vaccaro to a recent meeting. Vaccaro presented awards to two of the Derry club's members. Both Pete Marcotte and Gerry Daigle received membership chevrons for 35 years of service with the Derry Lions. "We are so fortunate to have these two individuals serving in our community, they give us so much and we appreciate all that they do," Lions club president Cheryl Harvey said. The Derry Lions have been in existence in the community for many years, hosting various activities and events to support club outreach and mission projects. The upcoming youth fishing derby is Saturday, May 4 at Hood Pond in Derry, and is one of the club's longstanding community events.